Women's Resource Fair – Organic Food, Eco-Friendly Products, and WINE! Come for the education and inspiration and stay for the fun! The Women's Resource Fair is happening Friday, March 23rd in Lake Geneva, WI – join me there for my 5:30pm presentation on Permission to Choose You (read more below) plus a spa night and wine sampling. Note: I am a guest speaker at the fair and will not be there as an exhibitor. The mission of the Women's Resource Fair is to give individual practitioners, non-profits and organizations that offer eco-friendly products, organic foods, alternative resources and sustainability a greater opportunity to enrich the lives of their community through the presentation of their services, products and programs and to offer all women a central, credible source for finding enrichment for their lives. MY TALK: 5:30 - 6:15PM with a book signing to follow for the book I co-authored, "Women Who Inspire"! Do you put other needs before your own? Do you allow your self-care to take a backseat? Do you feel that taking care of you first is selfish? Do you often feel drained, tired and off-balance? If you answered yes to any of these questions, then this presentation is a must-attend! Tally Hayden, Life Coach and co-author of Women Who Inspire, is an expert at helping women connect to their power within. She will be sharing her tried and tested methods for creating more balance in your life, opening the door to self-love and lighting your power within. Learn how to tap further into manifesting your best life as she discusses her book and shares the pitfalls and impact on your wellbeing that occur when you do not honor yourself first. This presentation will provide you with 3 important tools to connect to your power within to choose yourself, and why that is important to create a healthy, joyful and loving life. 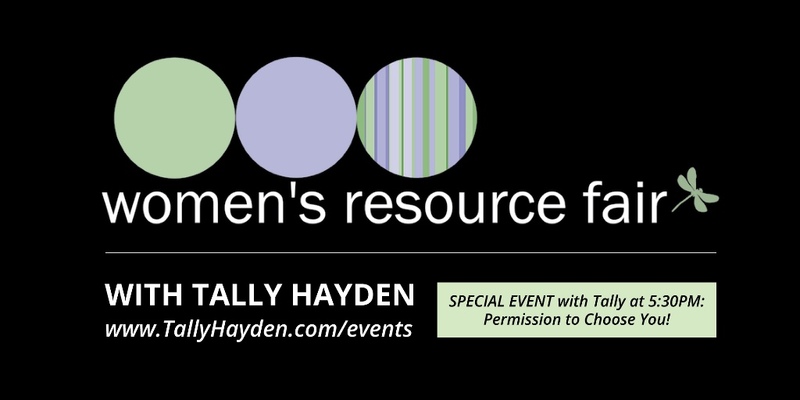 Take some well-deserved 'me time' by spending this session with Tally to learn key life tools, have the opportunity to get your own copy of her book at a discounted price, and receive a free eGuide called Manifesting Your Life: 5 Do's and Dont's. GET FREE TICKETS as my guest! Click the button below to RSVP and get your free tickets (scroll down after clicking)!